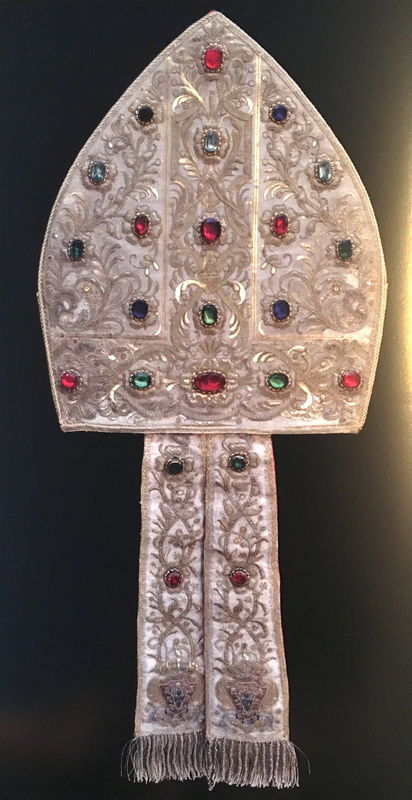 The Franciscans in the Holy Land are opening the next phase of the Terra Sancta Museum, a museum which showcases Christian history in the Holy Land along with its accumulated liturgical holdings which, LAJ is told, includes over a thousand sets of vestments, countless precious metalworks and much more of artistic and liturgical interest besides. 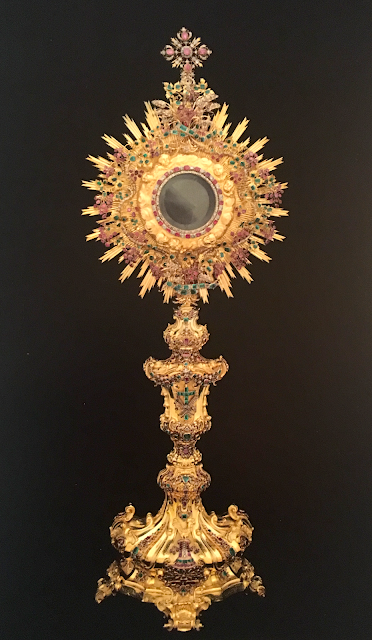 In addition to expansion of the museum, the Franciscans of the Custodia are also undertaking the publication of an extensive catalogue of their liturgical treasury. While the new catalogue is still in its preparatory phase (and will be published by Edizioni Terra Santa), the Custody was gracious enough to send LAJ a copy of the 2013 exhibition catalogue which inspired their new endeavour, "The Treasury of the Holy Sepulchre." 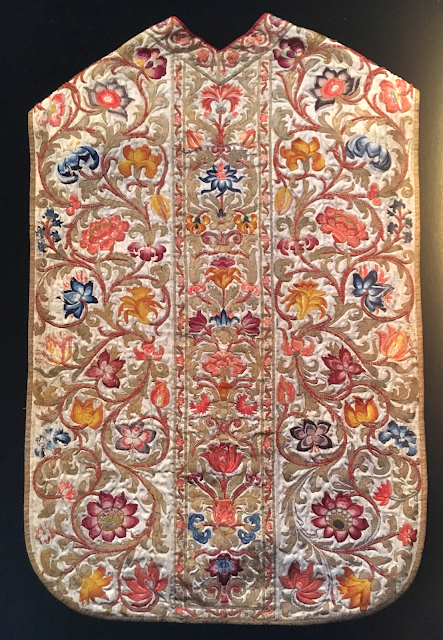 This publication features just a small sampling of the works that will appear in their own, much more extensive catalogue -- and given the excellence of what is found in the 2013 publication, one can only imagine what a more thorough treatment promises to reveal. “The idea of this Catalogue – [says] Father Stéphane Milovitch (Director of the Cultural Heritage Department of the Custody of the Holy Land) – was born gradually, starting from the study of the liturgical vestments that were exhibited at the Castle of Versailles during the exhibition “The Treasure of the Holy Sepulchre” in 2013, and of those that remained unpublished. 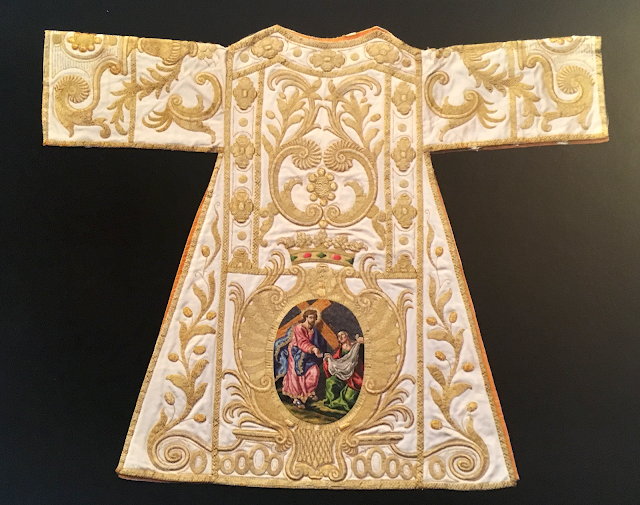 Given the quality and quantity of the items, we decided to direct the study towards the publication of a Catalogue of the Vestments of the Custody. 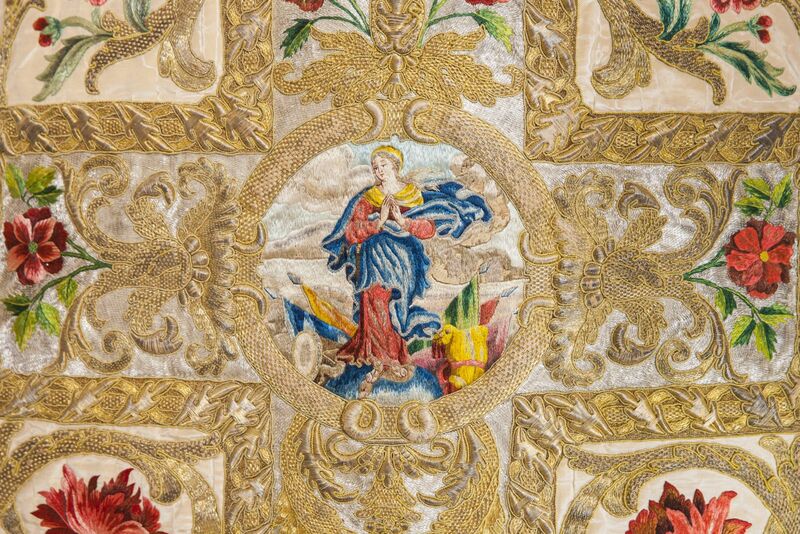 The book is curated by Maria Pia Pettinau Vescina, an expert in ancient textiles, and it also presents a contribution by Danièle Veron-Dènise, an expert in liturgical and secular embroidery, concerning the embroidered vestments exhibited in Versailles. In addition, Father Milovitch contributed with an essay about tradition and uninterrupted use of the liturgical vestments in the Holy Land... the catalogue will present a “treasure” that has remained largely, and for a long time, hidden and unknown, but very well preserved in the ample chests of drawers of the sacristies of the Franciscan monasteries. A scientific approach was used to describe the historical, stylistic, symbolic, and technical aspects of the items, and the numerous inscriptions and coats of arm that were present, relating these – wherever possible – to information available in documents from the Archive. 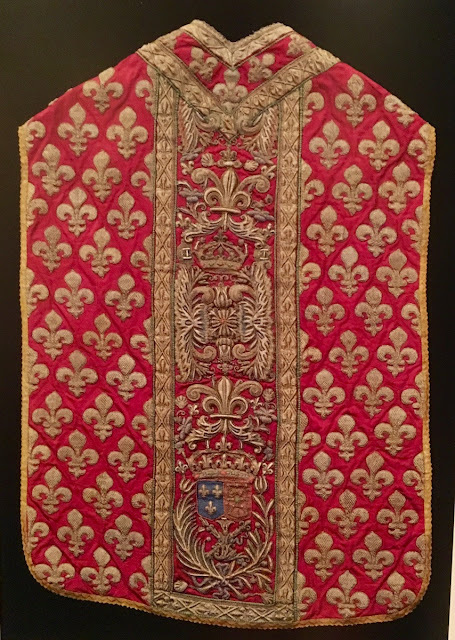 The use of precious documents, in particular the so-called “Registers of Conduct” and the inventories of the sacristies, has been fundamental in the research. 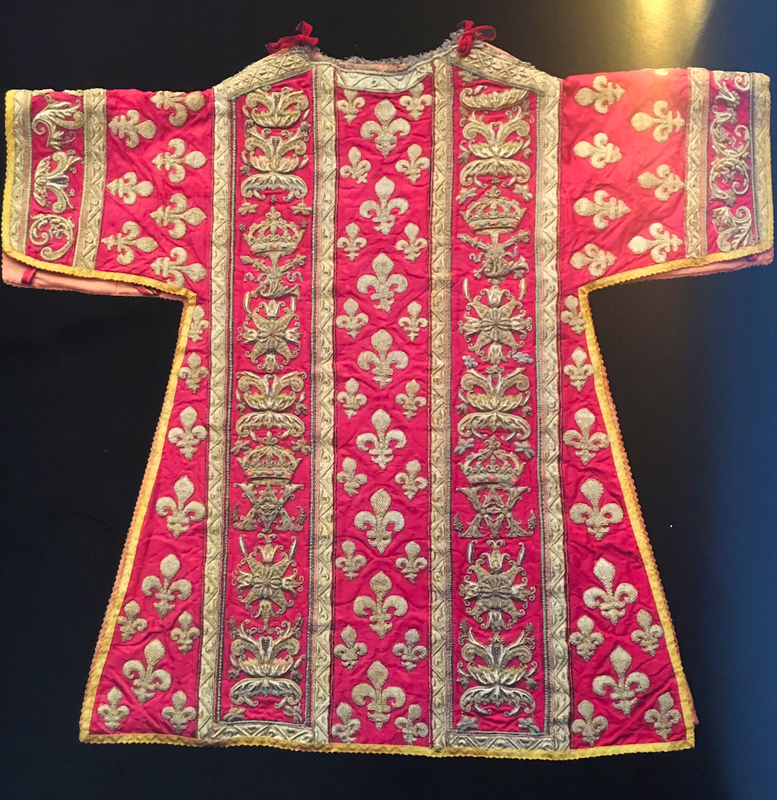 On the one hand, these sources supported attributive hypotheses and, on the other hand, they convey the living history of the vestments, the history of their devotional origin and liturgical function, and that of their constant care by the Franciscans. 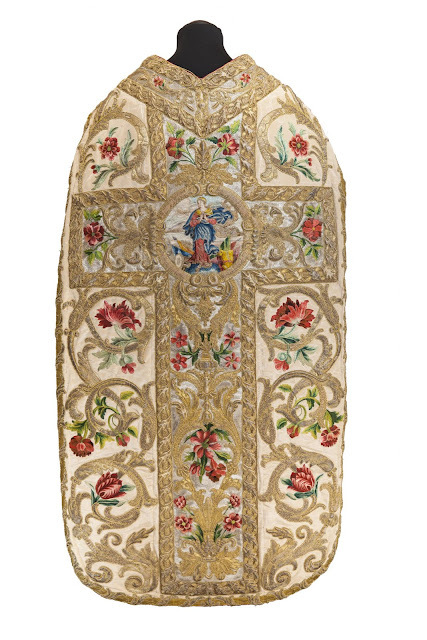 So many elements that, like precious threads, weave the historical context, becoming the warp and weft of the relationship between the great European powers and the Holy Land. A useful help for the readers are the glossaries concerning the typology, the use and function of the liturgical vestments, the symbolism of the liturgical colours, and the definitions of materials and weaving techniques. 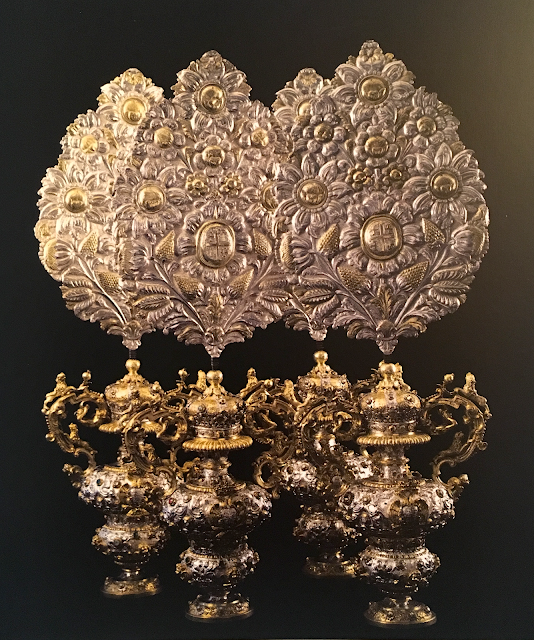 The editorial project of the new book series published by ETS for the Terra Sancta Museum is expected to present in the future the cultural heritage of the Custody of the Holy Land through monographic books about: Silverware, Mother of Pearl, Illuminations of the corals preserved by the General Library of the Custody, and Paintings. The book series will be anticipated in September by a “Number 0”, edited by Sara Cibin, presenting a selection of works (50 from the archaeological collection and 50 from the historical one) that will serve as a preview and a celebration of the most important works of the Museum. In short, this book -- Le collezioni tessili della Custodia di Terra Santa by Maria Pia Pettinau Vescina -- is only the first of more to come and it sounds like an extraordinarily worthwhile project. There are many books out there that showcase the liturgical arts, but when a catalogue comes available that is well photographed, well researched and comes from the most ancient and venerable sites of Christendom, this moves from a "nice to have" to a "need to have" for any liturgiologist or paramentologist worth his or her salt. 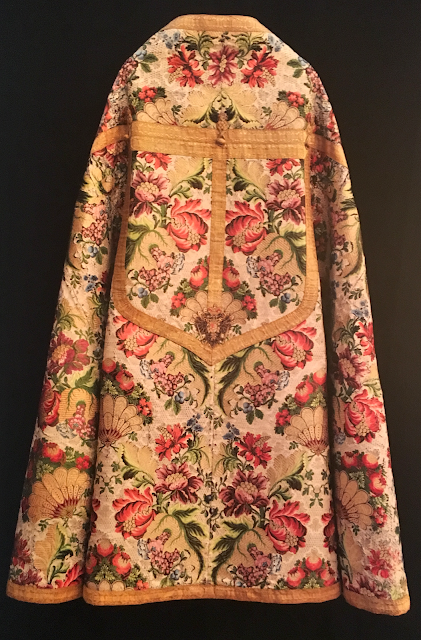 While we wait in anticipation for these new catalogues. to whet your appetite, here are just a few images from the 2013 exhibition catalogue which showcases some of the gifts of the Royal courts of Europe to Saint-Sepulchre down through the centuries.